A pendant light usually refers to a single light bulb covered by a lampshade and hanging by a rope, chain or stem. Pendant lights do not refer to chandeliers. 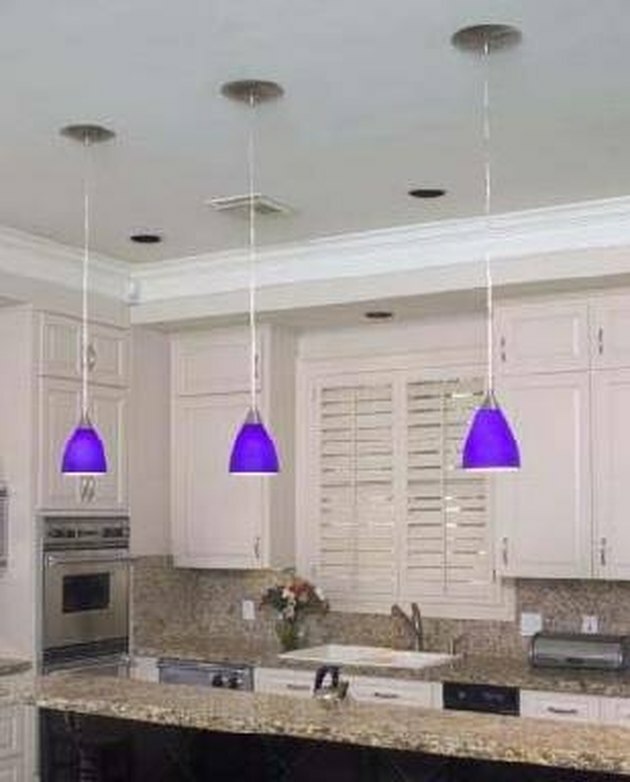 Pendant lights are usually installed in kitchens over islands or breakfast bars. They add a modern touch to the room and bring the light lower so that it is easier to see what you are cooking or eating. Before you install the light, you will need to take some precautions. The electricity should be completely turned off by using the breaker switch. Also, make sure you gather together the following materials: A ladder, screwdriver, and wire nuts. Remove the old light fixture by first removing any light bulbs, then unscrewing the casing. Next, detach the electrical wires of the light from the wires of the electrical box. The colors match up, so just remove white from white and black from black (or blue from blue). You may have to detach a ground wire as well. This wire is usually copper-colored. Finally, remove the old mounting bracket. The mounting bracket is fastened to the electrical box and is what holds the light fixture in place. Usually, this can be done with a screwdriver. Next, attach the new mounting bracket to the electrical box. The pendant light should include the mounting bracket. Again, installation should be easy with a screwdriver. Then connect the new electrical wires. Simply match the new pendant light's wires to the wires in the electrical box. Also, connect the ground wire directly to the electrical box. To connect the wires, use electrical-wire connecting nuts. Hold the ends of the wires parallel to each other with the tips at the same height, and screw the nut on top of them. Let your light hang down and test how long it is. You may need to adjust the length. As a rule, pendant lights usually hang around 30 inches above a work surface, but it all depends on what you prefer. To adjust the length, simply gather up the cord and place it under the mounting unit.